When you put these three words together – British, military, and fitness – images of a moustachioed sergeant major bellowing into your ear ordering you to get your backside in gear might spring to mind. But don't let such an image put you off trying a workout with British Military Fitness (BMF), an organisation that runs more than 400 classes a week, in more than 100 parks across the country. Though there may be the occasional moustache, any shouting will more than likely involve words of encouragement than admonishment. 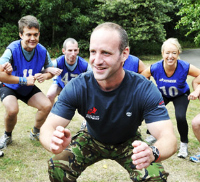 All BMF instructors are serving or former members of the armed forces, so if they don't know a thing or two about fitness training, nobody will. Everyone is welcome to join a BMF session, whether you're a super fit athlete who can run up and down mountains, or a doughnut fanatic whose idea of exercise is lifting up the remote to change channels. The instructors will split you into three groups: beginners, intermediates and advanced. That way you'll not be pushed beyond your limit (though you will be pushed a bit), and you can enjoy exercising with those of a similar fitness level. The sessions are carefully designed to get you into tip-top shape and be as much fun as possible. 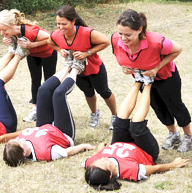 All fitness sessions take place outdoors, in parks. It's widely believed that exercising outside is far more beneficial to both mind and body than toiling away in a stuffy indoor gym. London locations include Battersea Park, Finsbury Park, Hyde Park, and Richmond Park. A comprehensive list can be viewed here. If you're tempted to get fit the BMF way, you can enjoy your first session for free. Prices for further sessions vary across the country, but for London locations it seems fairly set: £36 a month will get you one session per week; £48 a month for unlimited sessions; you can also book 10 sessions for £120, or 20 sessions for £180; under 21s and over 65s can take unlimited sessions for just £25 a month. BMF also organises runs, races, treks and hikes, open to everyone. Check here to see what's coming up. Why? Because these people know everything about fitness. Where: In parks across London, as well as the rest of the UK. Cost: Various options. See website for details.